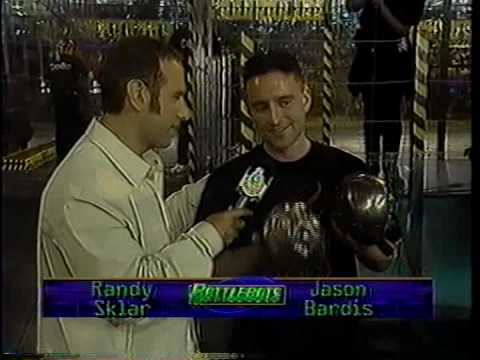 The Missing Link (built by Jason Dante Bardis) fights Ziggo in the 60lb lightweight division of BattleBots season 1.0. Classic season? one. Thanks for the upload. Hope one day it returns to TV in one form or the other. So if it wasn’t a phone book, what WAS attached to The Missing? Link? Reflection in the windows of the? battlebox. HOLY CRAP YOU’RE? RIGHT. HOW IS THAT POSSIBLE? I’ll go out? on a limb and guess the “blunt object on a stick” was intended to act like ablative armor. Screw your? spikes, blades, hammers, and flippers. I got a flippin’ phone book on a stick!